If you pay attention to the banking headlines, then you know that there is no greedier, more grasping regulatory regime pertaining to gouging the global banks than the United States' Federal Reserve and their co-conspirators over at the Justice Department. In only the latest example of picking the proverbial bankers' pockets to try to plug the holes in the sinking balance sheet of the American Federal Government, the Fed selected BNP Paribas as its current victim. This represents more than four banks that the Fed has now bilked out of hundreds of millions per individual institution regarding a so-called Forex scandal from years ago in the wake of the Global Financial Crisis and crash. BNP Paribas the latest target will cough up $246 million in this latest go round. This is the second time representatives of the Feds have come in to engage in a quick hit and run against them. The last incident brought by the State of New York yielded a more impressive $350 million payola score. With the agencies of the U.S. government behaving like so many modern day extorting mafia bosses, you need to consider the Top 5 Gold Coins for investors now. Gold makes sense in an IRA more every day. All you need to do now is to decide between physical gold and silver bullion versus gold and silver ETFs. It was only last Monday when the Federal Reserve Board cheerfully announced its latest pickpocket victim BNP Paribas. Between the French banking conglomerate and its financial subsidiaries, the Feds will nab a solid $246 million to punish them for their “unsafe and unsound practices in the foreign exchange (FX) markets” in the years between 2007 and 2013. Naturally the French banking giant has already strengthened its internal controls, compliance, and oversight measures. Of course they will keep boosting such improvements over time. In case you don't know, BNP Paribas is certainly not the first (mostly foreign mega bank) plundered by the Feds though, and it will undoubtedly not be the last either (as they currently have Deutsche Bank on the ropes right where they want them). Four other banks have already been fined in the ongoing Forex scandal saga. In fact, this has become a disturbing trend over the last decade or so. Every cash grab by the Feds takes on a different name and angle. The charges might be against secretive “Swiss styled” banking, tax evasion and avoidance help, money laundering for the Iranians and Mexican drug cartels, mortgage backed securities financial instrument sales fraud, or this latest excuse to rob the banks— the Forex scandal debacle. You might as well come to grips with the truth that the American Federal government and its various regulatory agencies will staunchly not admit to. These fines are not at all about punitive measures for unscrupulous banking activities. Rather they are cash grabs from an unlucky and unfortunate industry the government has successfully painted as villains, especially since the Global Financial Crisis revealed them to be money-grubbing gluttons who profited off of the decline and downfall of the American and Western-based economies. No one feels sorry for nor tries to defend the banks when the Feds make their rounds every other year calling for contributions to the massively out of balance American Federal budget. This time, the excuse is that the Federal Reserve Board has been thoroughly investigating “currency market manipulation.” To be fair, they are an equal opportunity plundering regulatory organization. Not only the French have been singled out, but also the Swiss with UBS, the British with Barclays and RBS (and often HSBC as well), and the Germans with Deutsche Bank. No wonder many European banks do not accept Americans as customers any longer. In fact it was not that long ago that the Federal Reserve gleefully announced that it was assessing a series of collective fines in excess of $1.8 billion on six major financial institutions for their continuous “unsafe and unsound practices in the foreign exchange markets of FX.” The fines amounted to quite possibly the highest haul the Federal Reserve has ever scored. They sent out the contribution-fines fair and square at $342 million apiece to UBS AG, Citigroup Inc., Barclays PLC, and JPMorgan Chase & Co. The shakedown was less steep for RBS Royal Bank of Scotland at $274 million (after all, the bank is now mostly owned by a super-friendly allied government in that of the United Kingdom), and for Bank of America Corporation at only $205 million. Most impressively of all, the Federal Reserve made their fining extortion regime look convincingly like a real legal smack down to cover their money grubbing tracks too. They issued actual cease and desist orders against the banking cabal mandating that they better their procedures and policies of control and oversight on all FX market- related activities and for similar markets. The Fed then declared the usual suspects of UBS, JPMorgan Chase, Citigroup, and Barclays to be involved in “unsound and unsafe” FX sales conduct in the way they did not properly disclose their means of determining foreign exchange price quotes to their various customers. To add still more trappings of legitimacy to the whole underhanded affair, The Department of Justice is conveniently cooperating on the criminal probe hand in glove with the Federal Reserve with regards to UBS, Citigroup, Barclays, JPMorgan Chase, and RBS for criminal misconduct in the foreign exchange markets. Somehow Bank of America escaped the wrath and ire of the crusading pair of Federal dynamic duo regulators, as they have not been criminally charged (at least so far). All that we can safely conclude is that BOA must have paid their fine in cash on the same day the bill arrived. But Wait, Deutsche Bank Hasn't Paid Up Yet! Before we can cry case closed on the issue and allow the banks of the world to collectively get back to making obscene amounts of annual profits, Deutsche Bank AG has not yet paid its fair share into the “Keep Uncle Sam Rolling” Fed fund. This is not a lucky oversight on the part of bank that has probably paid the most generous contributions into the government's sinking ship insurance fund over the past years. A person familiar with the matter allayed our fears that somehow Deutsche Bank would escape unscathed in announcing that the German banking currency trading giant is anticipated to pay fines to both the Federal Reserve as well as New York's Department of Financial Services for their alleged misconduct on the global foreign exchange markets. This way the government will hit them both coming and going in a tag team pincer move. The Germans may have avoided the more serious slap on the wrist as evidenced by the recently closed American Justice Department criminal probe into Deutsche Bank's no-doubt shady currency trading endeavors. Yet regulators are on their own quest and in the last stages of their personal reviews to ascertain the amount of the fines that the bank will be expected to pay out. The Federal Reserve has already closed its investigation and is merely keeping quiet on the specific fine amount until the New York State banking regulator similarly finishes up its own probe. All that remains is to determine how steep the pair of fines on alleged Deutsche Bank currency market misconduct will be for the Germans. There is also the matter of the still-ongoing U.S. Attorney office's criminal investigation into the dual offenses of the so-called “mirror trading” and Russian sanctions violations which successfully moved literally billions of dollars out of Putin's sanctioned-besieged Russia. You have to give the Federal Reserve especially (and also their partner the U.S. Justice Department) credit for trying to plug the holes in the leaky boat of the U.S. Federal Government's finances. They have managed between them to collect maybe $20-$30 billion in fines over the last few years since the end of the Global Financial Crisis and Great Recession of 2007-2009. It sounds truly impressive, until you consider that the CBO shows the U.S. government is sinking to the tune of a full trillion dollars per year. In other words, all of the profits that the banks book every year would not be enough to staunch the annual fiscal bleeding out over at the U.S. Treasury Department. They are $20 trillion in the hole and sinking another trillion most every year. Even all the twenty trillion in uncovered gold in the world is only enough to just cover the U.S. Federal Debt. This tells you why you should get your share of the yellow IRA-approved metals before the whole house of cards come crashing down on everyone. 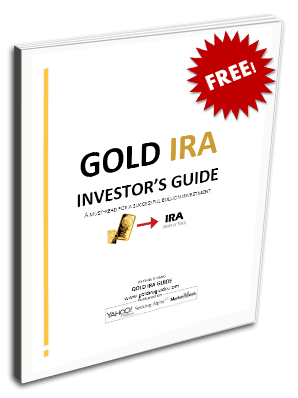 It's time to brush up on the Gold IRA rules and regulations.